The abstract collages in Mario Naves’ previous shows at Elizabeth Harris spoke eloquently of a particular approach to image-making, one involving a mixture of the tactical and the serendipitous. Constructed of painted and torn bits of paper, the collages were small in scale, but broad in their explorations. Their ragged contours and repositioned sections of brushwork probed formal possibilities within larger investigations of texture, materiality, atmosphere, and the allusive potential of shapes. For me, his highly tactile surfaces occasionally overwhelmed the formal events within. Naves’ sixth show at Elizabeth Harris reveals something new: a change in medium, and a more efficient attack that privileges composition over texture. Although still abstract, the works on view are all paintings with highly orchestrated geometric shapes. Close inspection reveals overpainting of areas of many canvases, but the smooth surfaces minimize the show of struggle. The physically layered depths of his collages are gone, replaced by another kind of depth, one purely pictorial in nature. This movement from suggestive textures towards definitive form brings some notable rewards. Most gallery-goers will be familiar with Naves’ extensive writings on art, and the formal rhythms of these paintings brim with the same directness and conciseness of thought. Newly evident is his eloquence of color, apparent in measured sequences of hues that run the full scale of tones and temperature, and most of the full range of intensity. Surface rhythms intensify the action of these colors. In “Louder than God” (2011), for instance, the retiring luminosity of a large, medium-blue plane partially surrounds a disk of a barely lighter, more exuberant purple, turning it into a buoyant punctuation mark. A wedge of heated yellow-brown counters it at the canvas’ opposite edge; shards of lighter hues deploy across the crest of the blue. But the chief competition is a red circle—identical in size to the first but more insistent in hue—that, perched precariously above the blue, seems miles from its secured, purple twin. Together, the pressures of color and shape impart a fullness to the rhythms: varieties of scale, necessity of location, contradictions of presence. This is exciting to someone who, like myself, sees painting as a formal art revealing itself in irreducible elements of color and line. With these ingredients taking the lead, each painting in the exhibition follows a new tack: the deck of cards deals itself anew, so to speak. In “Sundays Only” (2012), broad polygons—limpid green, subdued blue-gray, ruddy terracotta, ethereal cerulean— descend luminously from huddling disks at the canvas’ top. 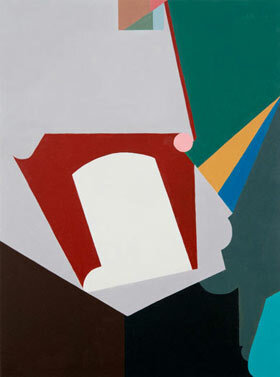 (As for most works in the show, the title perplexes, even as the image convinces.) In “Outsourcing Picabia” (2011), a tower of seesawing triangles lifts a “background” blue, despite the sinking pressure of a dark, orange-rimmed disk. At times compositions seem driven more by ideas than visual exigencies. The dominant event of “Obscure Reference” (2012), for example, is its horizontal division into planes of deep red-orange and warm gray, with the in-between contour continuously curling and kinking in a long journey to a singular blue swirl at the opposite edge. Though playful in design, for me the curls and kinks simply signify a conversation among elements rather than embodying it through color. This imparts to the canvas a somewhat over-pondered effect. In some paintings, the variety of color slackens when it comes to the highest-pitched intensities. More typical of this revelatory exhibition, however, is my favorite painting, “A Pigeon in Catalonia” (2011). Here, variously inclined shapes—pure white, heated rust-red, a pale, absorbent gray—commune noisily at the center before launching an ochre-and-cerulean wedge to the canvas’ edge; a small, sedate package of triangles observes from above. The full impact of such works, however, eludes words. Best to see them in person, in the flesh, where they speak as only colors and lines can.